If you haven’t tried meat buns yet and you love hamburgers you must give these little packages of love a try. Last week I made those lovely steak bakes for you and this week something a wee bit different. Meat buns are a no fuss put together meal that can be made the night before or frozen for another day for a quick on the run meal. I’m always looking for easy meat recipes so family doesn’t have to have the same meals over and over again. What I like about these meat buns are that they are unique. The Japanese have something similar with their Japanese meat buns although I believe they are steamed buns. I’ve never had them before but I would like to one day. They are comparable to what a Cornish pasty is in the UK. If you haven’t had a Cornish pasty before you must try one. My friend over at Farmgirl Fare has an amazing recipe for Cornish pasties which are traditional and created by the one and only popular British Chef Jamie Oliver. I make my own as well and I’ll share that recipe with you one day soon. Usually batch day for me is on a Sunday so I can fill the freezer with various meals that are easy to make especially with three kids and a husband in the house. Now even though they are called buns they are made with a really soft dough that is shaped like pies. If you are worried about how to make dough, don’t be it’s very easy. This meat buns recipe will make a batch of 32 pies which is enough for any household to put in the freezer. You can make the meat buns bigger or smaller depending on your preference but my kids enjoyed the smaller ones and they easily managed two each. My husband also enjoys these meat buns cold the next day for lunch as well which makes them perfect to take to work or school. Ground meat is a great meat to use for many of my fast and easy meals that I create as batch meals. Ground mince whether it be pork, beef, turkey or chicken can be cooked up and mixed with loads of different herbs and spices then frozen to make an easy meal. 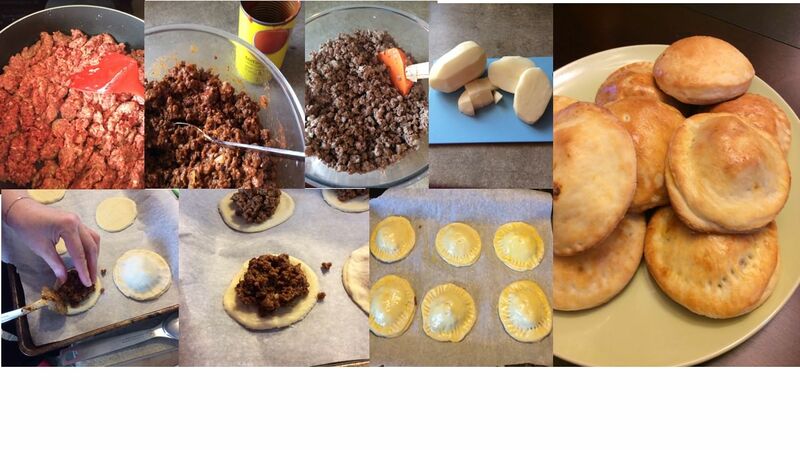 Any ground mince can also be created into chilli or tacos even Lasagne which is a big favourite here. This is why batch cooking is so important in my house as it’s all made up and put into the freezer so I always have something quick to cook on hand. 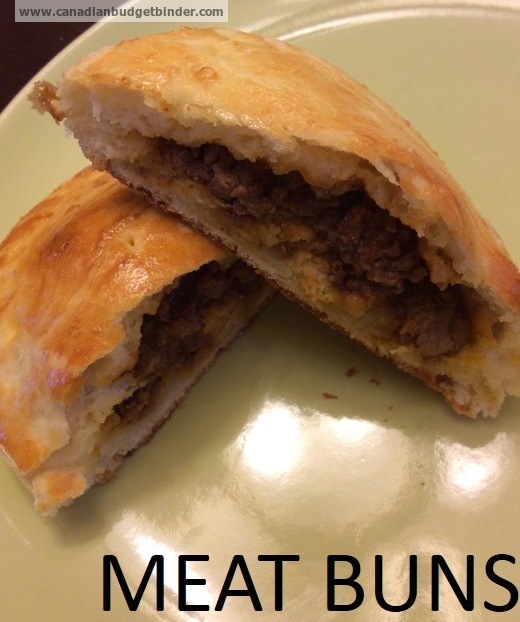 Meat Buns are a great way to change up your everyday meat meals with something unique and easy to create that the family will enjoy hot or cold. Take ground beef and cook until well-done. Then cool or freeze until needed. To make dough cook potatoes in 2 cups of water. When very soft drain and save the water and set aside. Mash potatoes and add to the potato water. Place dough on a floured surface and cover with bowl. Let sit and rise until doubled. Roll out a portion of dough on a well floured counter top or board and cut about 3 inch rounds (I used a tumbler). Fill with a teaspoon of meat mixture, you can either just fold over and pinch or double up on rounds one on top of each other. Let rise for about ¾ hour. Bake meat buns until golden brown on top. If you are freezing follow all steps except glazing place on a sheet separately. Freeze then take of the baking sheet and place in freezer bags. So if you are on an all meat diet and just can’t bear to eat veggies sneak in some of these lovely meat buns. There you have it a big batch of meat buns either ready to eat or freeze for an easy meal any day of the week. Does having debt mean you have too much money fun?